Bernhard Wicki's film Die Brücke (The Bridge) won 44 festival awards including the Golden Globe for Best Foreign Language Film and was nominated for an Academy Award in the same category. The film kickstarted the career of several German actors, including Michael Hinz, Volker Lechtenbrink, Cordula Trantow and Fritz Wepper. Virtually no-one in the industry had anticipated this kind of success. In fact, most stakeholders had advised director Wicki not to produce the movie at all for fear it would not find an audience. One of the strengths of the film is certainly its authenticity. Though the story is based on the novel of the same name by Gregor Dorfmeister and set in Upper Bavaria, after an extensive location search Wicki opted for the city of Cham in the Bavarian Forest. Its main asset was the concrete Florian-Geyer bridge with the silouette of period-appropriate buildings in the background. An additional bonus for the filmmakers was that the area on the southern end of the bridge was free of any buildings. This was important, as the film crew had to construct a set consisting of a couple of houses and several stone walls. This is the direction from which the three Sherman tanks and a group of soldiers from the US Army advance toward the town. 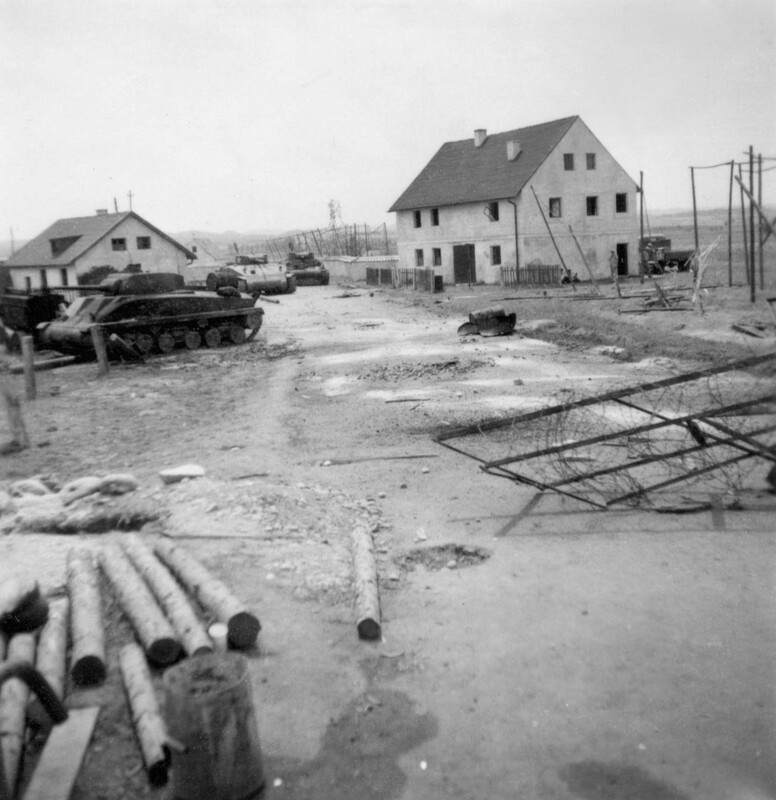 In this picture the set construction south of the bridge is under way: the two houses were mere facades. Even the three tanks were replicas built in Munich, as the US Army refused to provide the real deal. Die Brücke is based on Gregor Dorfmeister's personal account of defending a real bridge in the town of Bad Tölz against US forces in the Spring of 1945. Although he filmed in summer, Wicki wanted to stay true to the look and feel of a German spring. He ordered his crew to remove the leaf-bearing branches of several trees along the river bank - without asking the town's administration for permission. This resulted in a legal battle lasting for months. View from the bridge onto the defoliated trees along the river bank. A crew member is preparing the set for filming one of the battle scenes. Almost 60 years later, many of the buildings behind the bridge still exist. The bridge itself, however, was replaced with a modern construction in 1991. We visited in the winter of 2019 when the trees really were lacking any foliage! A metal banderole with several film stills celebrates the 40th anniversary of this incredible movie. A number of town buildings were also used in the film but most of these are not publicly accessible. The main location around the river and the bridge, however, is still very recognisable - if only when looking towards the town. The field on the southern end has long since been converted into a park and ride car park. Klaus, Franziska and Hans in happier times. Shortly after, the boys have to join the German Wehrmacht. The following location is about 100 metres downstream from the bridge. Karl runs into trouble with the police over a secret dash of alcohol. The pin on the map marks the position of the current bridge. After you've checked out the bridge, head to the market square where you will find the charming Kaffeerösterei Chamer Land. These guys really know what they're doing - and where their coffee beans come from. And best of all, they even serve a Flat White - unheard of in Germany!